Ogden will once again transform into “XTERRA Title Town USA” as the nation’s leading off-road triathlon and trail running series host XTERRA USA Championship races on back-to-back days on September 19-20. September 16, 2015 (Ogden, Utah) – Ogden will once again transform into “XTERRA Title Town USA” as the nation’s leading off-road triathlon and trail running series host XTERRA USA Championship races on back-to-back days on September 19-20. The two events attract more than one-thousand of the nation’s very best amateur and professional triathletes and trail runners from nearly every state in the U.S. to Utah to battle for the title of XTERRA National Champion. The off-road tri Nationals is Saturday, Sept. 19, along with full and half-distance XTERRA Utah races open to everyone. The XTERRA Trail Run Nationals half-marathon is Sunday, Sept. 20, accompanied by 5K and 10K trail runs. Both events will be filmed for nationally syndicated TV programs exposing the beauty of Utah to millions. In addition to the races, XTERRA will host an expo in downtown Ogden with free kids races, vendor booths, a Paul Mitchell hair cut-a-thon for charity, and evening dinner parties. Simultaneously, Ogden hosts its 14th annual Harvest Moon Celebration with a wealth of family-friendly activities planned for all ages including live music, great food, and kid’s activities. There is a lot to be excited about for off-road triathlon fans with compelling match-ups in both the men’s and women’s elite races. The headliner in the men’s race is Josiah “Beast Mode” Middaugh, a 36-year-old from Eagle-Vail, Colorado. He has been the grimacing face of XTERRA in the U.S. for more than a decade now and has 10 XTERRA National Championships to prove it. He enters the race as the points leader and two-time defending champ of the U.S. Pro Series, and winner of the last two regionals at the East Championship in Richmond and Mountain Championship at Beaver Creek. Since Nationals moved to Utah in 2009 Middaugh has been in the top three at every race and took the title outright in 2012. To repeat that performance he’ll have to get past a determined Kiwi named Braden Currie, a world-class mountain biker named Todd Wells, and the top six ranked men in the Pro Series. For Currie, a Red Bull sponsored athlete that made a name for himself as one of the biggest stars in adventure racing, the goal from day one this year was to win the XTERRA USA Title, Pro Series, and World Championship in that order. He proved he could race with and even go faster than Middaugh in a thrilling toe-to-toe race he won at the Southeast Championship in Pelham, Alabama earlier this season. As for Wells, an unknown in XTERRA but absolute legend in mountain biking, he said he’s just “hoping to survive swimming in a wetsuit and get to the finish line.” Awfully modest for a two-time Olympian and winner of a ton of major mtb races and there are more than a few people out there who think he has a legitimate shot at taking the tape. While Middaugh, Currie, and Wells grab the headlines there are a wealth of fast racers in the field who could make some noise themselves. Guys like Chris Ganter, Branden Rakita, Ryan Ignatz, Olly Shaw, Brian Smith, Matt Lieto, and Andrew Russell have all proven themselves through the years and are capable of coming up with big performances. In the women’s race Park City’s own Emma Garrard is in position to win the USA Championship and the Pro Series in one fell swoop next Saturday. With Suzie Snyder still recovering from a fractured pelvis and no Flora Duffy or Lesley Paterson in the line-up, Garrard is the clear-cut favorite in the women’s elite race. For Garrard, who has finished 2nd to those three at five races this year and all eight regional championship events over the past two seasons, being labeled the favorite is just fine. Sara Schuler of Boulder, Colorado, who like Garrard has a toddler to take care of along with a full workload, is also hoping for some magic next Saturday. While Garrard and Schuler seem the favorites there are a handful of elite women who have had breakout seasons this year and two months to fine-tune their endurance. Put Maia Ignatz, Kara LaPoint, Catherine Sterling, and Jaime Brede in that conversation and the top five spots are certain to be hotly contested. 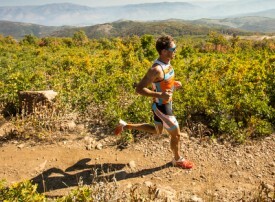 Follow the elite race live on twitter @xterraoffroad, #xterraUTAH starting at 9am MST on Sept. 19. The reigning XTERRA Trail Run National Champion Brett Hales from Layton, Utah is returning to defend his half-marathon national title at Snowbasin Resort on September 20th, but will be up against fierce competition in the form of familiar foe and two-time XTERRA Trail Running World Champion Patrick Smyth of Salt Lake City. Smyth, who won the 2013 XTERRA National Title in Utah, was equally complimentary of Hales. Hales is equally excited and echoes what Smyth said about the course at Snowbasin truly being the star. “After last year’s XTERRA National Championship I was made a trail run fan for life,” said Hales, who did his first-ever trail race at Snowbasin last year almost on a whim. Hales and Smyth aren’t the only stars to join the line-up at the XTERRA Trail Run National Championship, as the reigning women’s champion Liz Stephen, a two-time Olympic cross country skier, is also set to return. The Paul Mitchell XTERRA Trail Run Nationals was staged at Snowbasin Resort for the first time in 2011, and it received rave reviews from the runners. Runners of all ages and skill levels can participate in the Paul Mitchell XTERRA Trail Run National Championship, as there is no qualifying process. Last year, close to 500 trail runners from 30 different states gathered at Snowbasin Resort for the event. There will be three different courses to accommodate the various levels of runners. A 21-kilometer half-marathon course will serve as the national championship course, but there will also be a 10K and a 5K. Every age-group winner from the 21K course will be awarded a free entry to race at the 2015 Paul Mitchell XTERRA Trail Run World Championship at Kualoa Ranch, Oahu, Hawaii. The Paul Mitchell XTERRA Trail Run Nationals will be held one day after the XTERRA USA Championship off-road triathlon to create the ultimate XTERRA racing weekend. The 2015 XTERRA Nationals weekend is presented by the Utah Sports Commission, Paul Mitchell, and XTERRA Travel. Sponsors include Outrigger Resorts, the GOAL Foundation, Gatorade Endurance, PowerBar, ENVE, Utah Media Group, the U.S. Forest Service, XTERRA Wetsuits, Snowbasin Resort, Muscle Milk, XTERRA Fitness, LifeProof, Optic Nerve Sunglasses, Greenlayer, Salming, and XTERRA Boards.